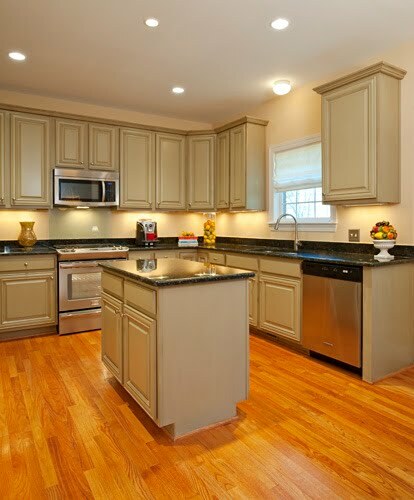 We have done all sorts of kitchen remodels. We've knocked out walls, moved windows and doors, and put on additions to bring our clients' dreams to life. But many times, all a kitchen needs is a little love. Many kitchens have good "bones" - they are laid out well and have a good flow to them, but they lack character. Homes built in the past 20 years, especially, where builder cabinets, countertops and finishes were installed as a matter of course are everywhere. You've seen them, and maybe you have them - the stock white cabinets with pressed-board vinyl-coated doors on them. We know it's no one's dream to have kitchen cabinets where the vinyl is peeling off. The good news is that this is a very reasonable job to tackle. With the cabinets already in a good location, and with the body of the cabinet being sound, many times we can simply re-face the cabinets with solid wood doors and paint or finish them to the client's liking. Likewise, countertops can be easily installed since the lower cabinetry remains in the same place and can be easily measured and fitted with a new material. Add in a couple of new finishes like a faucet and knobs and you're done. This is exactly the type of job our friend Laura Bright came to us with. Her home was 14 years old and the kitchen, with its stock white cabinets, laminate countertops and fluorescent lighting was looking more and more dated by the day. Laura told us, "The final straw came when I started my own marketing company and was working out of the house. I got tired of looking at cheap cabinets - clearly something had to be done, so I called Classic." Laura's budget was not huge (she was starting a business after all! ), so she was thrilled with our recommendation. After looking around her kitchen, we told her that her existing layout and cabinet boxes were workable, and that a simple face lift would have a huge impact on the space. We presented Laura with several solutions that fit within her budget - cabinet door and countertop choices, options for finishes, even recommendations for paint colors. She was very involved in the process, and the result of our collaboration is a kitchen that reflects Laura's taste, lifestyle, and home perfectly. 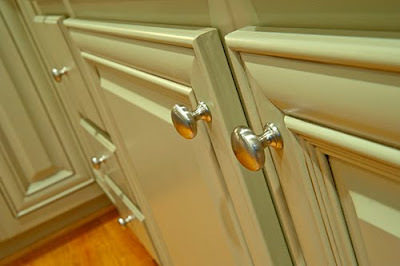 The cabinets are now a beautiful sage green color, lightly stained to give them an antique appearance. The countertops are a dark granite, picking up the antiquing in the cabinets. And the simple silver knobs and stainless appliances lend a touch of modern. In addition to being pleased with the outcome, Laura was pleasantly surprised by how smoothly the process went. "The workers were amazing. They meticulously taped off everything (and my kitchen is completely open to the two-story living room) so there was no dust in the house - the care they took with this went beyond anything I could have imagined. They were always on time and very respectful and polite. I felt so comfortable with them in the house that I handed over the keys and left on a cruise for five days. I didn't worry about the house once." And the service didn't stop when we cleaned up and presented Laura with her beautiful new kitchen. "A couple of weeks after the job finished Bob came over for a party I was throwing. He happened to notice a seam on the wall that wasn't quite perfect. There were people there the next day to fix it." At Classic we work extremely hard to make sure our clients are thrilled with their new spaces. As a result, we receive wonderful client feedback, and Laura was no exception. After living in my home for ten years, I finally decided to move forward with a long overdue kitchen face lift. While I was familiar with Classic Remodeling and their exceptional work, I felt that my project (and budget) would be too limited for their services. How wrong I was. It was a pleasure to hear their recommendations, meet members of their team, watch their work in progress, and experience the professionalism and integrity of this company. My new kitchen is absolutely gorgeous. It looks far more expensive than it was and has brought huge value to my home. I'm thrilled with the job done by Classic Remodeling & Construction. When you've worked hard to make someone happy, you can't really ask for more than that.